The New Year's Rengo 2002 reached this position early on, with Black to play. I entered a move at a as , which was criticised for various reasons, most of which I agreed with (had to, really, they were made by much better players...). It seemed to be suggested that Black should play in the top left, probably at b or c.
DaveSigaty: Ignoring the question below for the moment, I thought playing at a was quite an interesting choice in this position (not in the books but so what :-). The reason is that the marked white stone is low so although d might be thought of as attacking the white stone to the right more strongly than a, it has no exciting follow-up along the bottom. If Black does not finish the bottom after d then White is likely to take the opportunity to play to the left of a at an early stage and Black's choice is going to look more slack than strong. In handling her stone on the right after d White can concentrate on limiting Black's opportunities on the right knowing that the bottom is uninteresting. After a on the other hand, Black can concentrate on building up a right-side framework as White tries to deal with her stone. My question is: doesn't this (Black playing in the upper left) lose the initiative for Black? 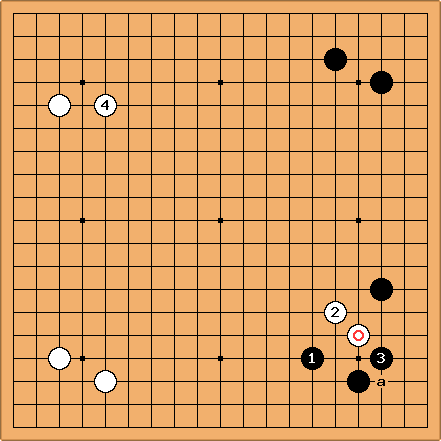 Say Black 9 was played at d, to attack the white stone more strongly, and White then played b to make a second enclosure. I think Black can then play either at e or at f and rely on the weakness of the bottom left white stone to take control of the game. This seems fine for Black to me. What do people think? If Black plays in top left, instead, I think that g is the normal play. As for the question of initiative, the two corners on the left are miai. It is usual for White to make an enclosure in one and Black to play an approach in the other. For Black to do that does not mean a loss of initiative. On the other hand, Black is not required to prevent a double enclosure. Go is not so narrow. It is important for White not to try too hard to save her floating stones in the lower right. They are kikashi stones, and should function as a thorn in Black's side (aji). 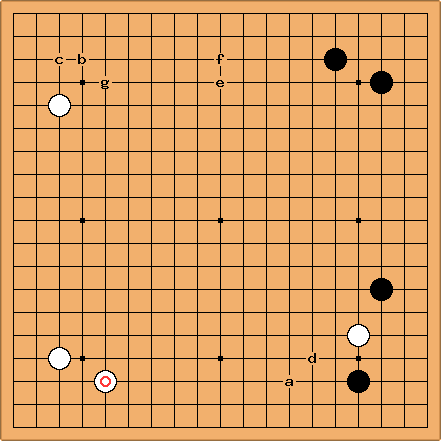 Black has made two more plays in the bottom right than White, but has not made an enclosure. Therefore these white stones have done their work and are easy to throw away. DaveSigaty: I think that White would be better off playing elsewhere directly, instead of adding first. The exchange of for eliminates the aji of White a, amongst other possibilities. If White ignores , it is not clear how Black can enclose the white stone in a way that justifies having played three more times in the lower right. , for example, may look severe but at some point Black will have to demonstrate a refutation of White a, or add yet another stone.